Summary: Most people are still asking the question of why the province decided to suddenly switch the Evergreen Line to SkyTrain technology in 2008. I think we should be asking questions about why the LRT design process suddenly stopped, with no reason, back in 2007. It’s coming to our region, but it’s opening in 2017, which just happens to be yet another delay in a consecutive series. These Evergreen Line delays have injected a new wave of doubt among transit observers here in Metro Vancouver, who may remember a time not too long ago when the Evergreen Line was comparable to a hot potato – hardly anyone could come to an agreement about it. During the late 2000s the Evergreen Line went through numerous hurdles that we worry about in transit issues today; ranging from funding shortages to planning issues to a lack of clarity in the political commitment to the line itself. But, to some people, I can imagine the most perplexing thing about the Evergreen Line story was the controversial change from an at-grade Light Rail Transit system, to the currently-being built extension of the existing SkyTrain system. It took people by surprise, changed the focus of the discussion and was so significant that it caught the attention of transit bloggers in other Canadian cities. The move was controversial because of the creation of a new business case released by the provincial government (hereafter referred to as the “2008 business case”) that overrode a previous business case released by TransLink (the “2006 business case”) for the Evergreen Line as an LRT. A following, final business case by the province(the “2010 business case”) adopted the results of the 2008 business case without making major changes to or addressing its supposed issues. Ridership – ALRT will produce two and a half times the ridership of Light Rail Transit (LRT) technology; this is consistent with the ridership goals in the Provincial Transit Plan. 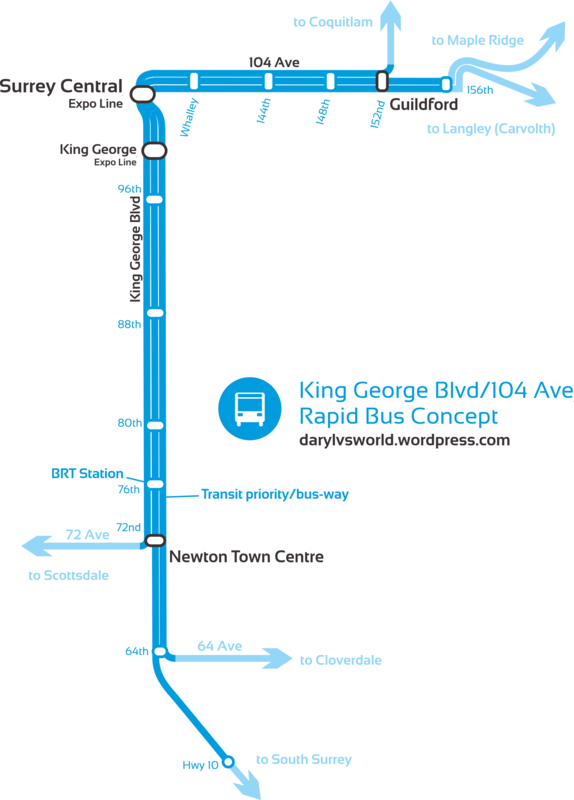 Travel Time – ALRT will move people almost twice as fast as LRT (in the NW corridor). Benefits and Cost – ALRT will achieve greater ridership and improved travel times at a capital cost of $1.4 billion, with overall benefit-cost ratio that favour ALRT over LRT. System Integration – ALRT will integrate into TransLink’s existing SkyTrain system more efficiently than LRT. Light Rail advocates who looked into the study insisted that the new analysis, in its rejection of what was supposed to be a sound business case, was biased in favour of SkyTrain – some of which alleged that the switch was a result of insider connections, shady agreements, and other under-the-radar proceedings. 2008 was a time when it wasn’t as clear to people that SkyTrain isn’t a proprietary transit technology and it was probably no surprise that critics of the decision came in waves. 2. A Portland-based transportation engineer named Gerald Fox alleged that the analysis had been manipulated to favour SkyTrain. (The original letter was posted [HERE]). At the time, no one could present an argument strong enough to combat what seemed to be a legitimate series of concerns on the SkyTrain proposal. The decisions of 2008 and the surrounding controversy continue to be reflected in the words of today’s writers, most recently surfacing with the announcement of the recent Evergreen Line delay and the ongoing SkyTrain versus LRT debate in Surrey. However, when the Auditor General of British Columbia was asked to look into the Evergreen Line technology switch, the Auditor General’s finished report in 2013 concluded that while some information was missing, the switch to SkyTrain was the right decision. In the approximately 3 years since this Audit was released and the 7 years since the decision to switch to SkyTrain, new information has been released that makes it possible to fill in all four of these gaps, as well as the other concerns raised by critics and the City of Burnaby. In an effort to compile this new information, I performed the research myself, which included extensively looking into all business cases (2006, 2008 and 2010) and other supporting evidence (including all 61 archived pages of the original Evergreen Line LRT discussion thread on Skyscraperpage). With the conclusion that the Evergreen Line business case was not manipulated to favour SkyTrain, I present my results below. 1. Were SkyTrain and LRT compared properly? The first and foremost concern by the auditor general was that the SkyTrain and LRT options may not have been compared properly – as sufficient information on aspects like ridership wasn’t provided. An explanation of how the ridership estimates were conceived was not provided in the 2008 business case, but there is little reason to believe that the 2008 business case was wrong in assumptions. As the capital cost estimates for LRT increased from $970 million (2006 business case) to $1.25 billion (2008 business case) with little explanation, the City of Burnaby complained that this increase was unreasonable – especially as it brought the cost difference with SkyTrain down to a mere $150 million (12%). Light Rail advocates and critics, including Gerald Fox, complained that the cost increase was manipulated to favour SkyTrain. It was noted in the 2006 study that the cost estimate of then was done at a 90% preliminary design stage – not a fully detailed design stage presenting a finalized cost. It thus seems conceivable that costs increased while the final alternative was being analyzed for the 2008 business case. Recently I performed some research on the capital costs of Canadian rail transit systems. With several rapid transit and light rail systems now proposed across the country, I took the opportunity to compile an inflation-adjusted comparison of the project capital costs – adjusting each project for the amount of grade-separation (tunnelled or elevated) and using that as a guideline to compare the costs. This extensive research took me several weeks to complete as I had to manually measure most of the proposals to assess the amount of grade-separation. 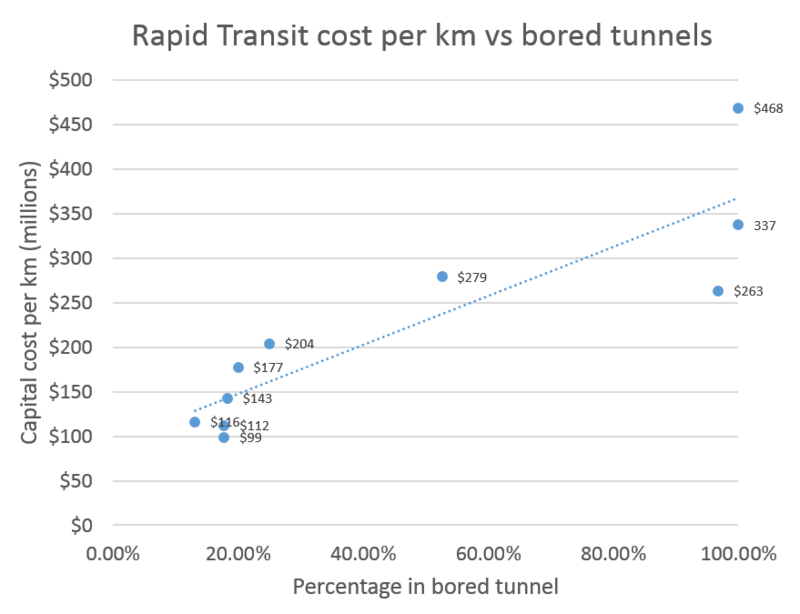 Unsurprisingly, I reached the conclusion that with the steepest trend in perecentage-to-cost, bored tunnel is the most expensive alignment to construct. The Evergreen Line, no matter whether it were to be SkyTrain or Light Rail Transit, has a 2km bored tunnel as a part of its alignment through the mountainous terrain between Burquitlam and Port Moody. This accounts for about 20% of the entire route. 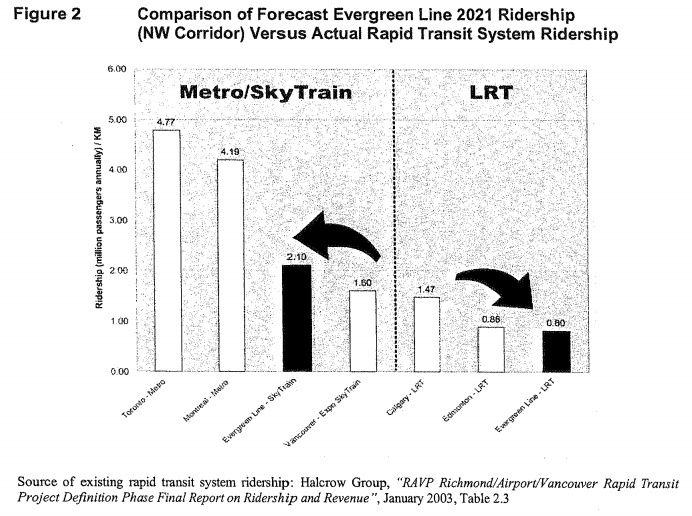 (Open to enlarge) – The Evergreen Line’s 2006 estimate is marked by the “$99” at the bottom left. The 2008 estimate is the $112 above it. My measurements indicated that the 2006 cost-per-km estimates were the lowest of the other projects. 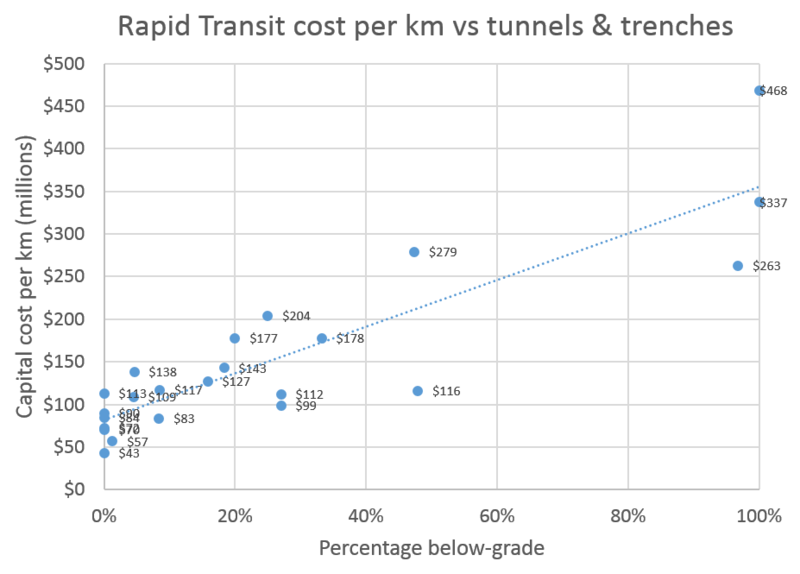 The estimate was significantly below other projects with a ~20% bored tunnel percentage, and below the average trend line that related percentage in a tunnel to rapid transit cost per km. In other words, the 2006 cost estimates are too low and were probably incorrect. And now that we know how much trouble it took to construct the Evergreen Line’s 2km tunnel, it’s certain that the LRT project’s final cost would have come closer to $1.25 billion. LRT tunnels need to account for pantographs and higher vehicle heights; whereas the linear motors used on our SkyTrain technology lines are more optimal for tunnels as the train is lower and closer to the ground. As a result, an LRT tunnel would have been larger and more complex and would have likely lead to additional potential problems. Just imagine what kind of liability chaos there’d be if a sinkhole did open under a home above the tunnel route. It hasn’t happened with our SkyTrain tunnel, but it’d be more likely under a larger tunnel (and larger tunnel boring machine) needed for an LRT. The operating costs rose from $12.21 million in 2006 to $15.3 million in 2008 (both measurements were in 2007 dollars). While it doesn’t seem that anyone in particular raised this as an issue, the cost increase can be explained by a difference in service frequency. The 2006 business case’s estimate was based on a 6 minute initial operating frequency. The 2008 business case’s operating costs were based on a higher 5 minute initial operating frequency. Whereas the 2008 cost estimates are 25% higher while a 5 minute frequency is 20% higher than 6, the newer numbers seem just about right to me. Burnaby complained that the Evergreen Line’s LRT speed estimates were lower than two existing LRT systems in Canada (Calgary and Edmonton). However, most of Calgary and Edmonton’s LRT systems are built off-street, and with gated crossings and absolute priority like railway systems. Most of the Evergreen Line as an LRT would be in the middle of streets and would have to follow the roadway speed limits (typically 50-60km/h). Naturally, this would result in slower average speeds than Calgary and Edmonton, where trains may run at 80km/h on dedicated rights-of-way. While the SkyTrain alternative had much higher average speeds than the current system (with its average of 43km/h), the addition of Lincoln Station has added some length to the travel time to the extent that the Evegreen Line’s end-to-end travel time is now usually described as 15 minutes – an average speed of 43.6km/h. Even then, at the end of the day these differences aren’t really dictated by the transit technology. The Evergreen Line will have the system’s longest station-less segment, which is largely in part due to the 2km tunnel between Burquitlam and Port Moody stations. The higher average speeds near here would be comparable to other long sections crossing geographical features, such as the 2.3km SkyBridge segment on the Expo Line over the Fraser River. 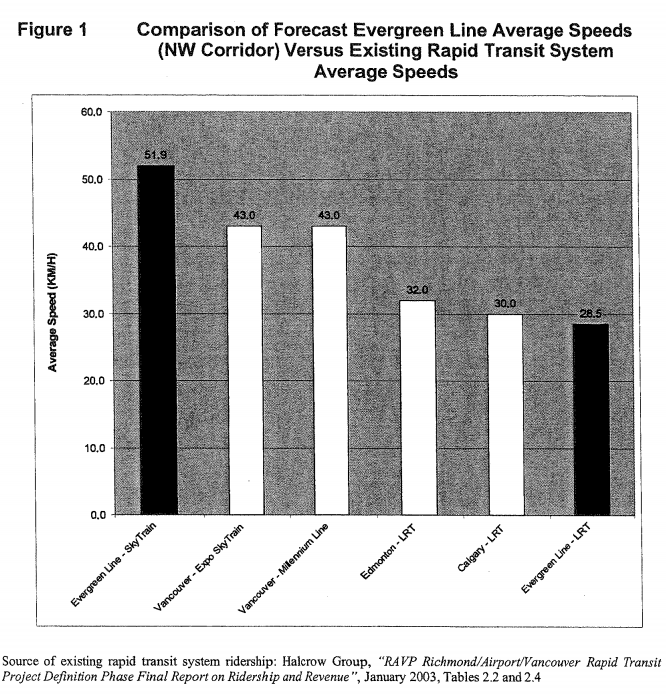 Gerald Fox also raised an issue that the stated maximum LRT speed in the 2008 business case (60km/h) was lower than the potential speed limits that could be achieved in the off-street, 2km tunnel. The 2006 business case accounted for faster running speeds of up to 80km/h inside the tunnel. However, the end-to-end travel time estimates in the 2008 business case were actually lower than that of the 2006 business case by 0.4 minutes. Thus the 60km/h expression was probably meant to highlight the speed on most of the on-street sections (outside of the tunnel). Based on the data I’ve collected above it doesn’t seem that SkyTrain and LRT were compared unfairly. There could’ve been better distribution of the info at hand, and some improvements in the planning process (like the addition of Lincoln Station from the beginning). However, no skewering of the numbers and manipulation to favour SkyTrain has taken place. Ridership was an additional concern raised by the City of Burnaby, which complained that the ridership estimates for the SkyTrain option (at 2.1 million passengers annually/km) were too high, and that the LRT ridership estimates were too low. The LRT ridership estimates were said to be too low because they were lower than two existing Canadian LRT systems (40% lower than Calgary, and 9% lower than Edmonton). For the same reasons as I explained above, it’s not possible to put the Edmonton and Calgary systems in the same category as an Evergreen Line LRT. The Evergreen Line LRT is largely on-street; the Calgary and Edmonton systems are not, and tend to run on exclusive rights-of-way at speeds of 80km/h. This leaves the high ridership estimates with the SkyTrain system. The auditor general raised an issue that the SkyTrain ridership assumptions with the Evergreen Line were made with assumptions that a completed transit network would be built by 2021 following the Provincial Transit Plan. This included SkyTrain extensions in Broadway and Surrey, neither of which will be built by 2021 based on the current situation. Burnaby complained that at 2.10 million annual passengers per km, the estimates were higher than the existing SkyTrain system (1.60 million annual passengers per km) and thus much higher than would be realistic. It’s important to note that the SkyTrain ridership estimate in Burnaby’s report was taken before the Canada Line to Richmond was introduced in 2009. The Canada Line’s opening broke ridership records with ridership almost immediately shooting up to its current level of 40.2 million passengers per year or over 120,000 per weekday – numbers that were well ahead of schedule even beat entire, city-wide LRT systems in ridership. When this annual ridership is worked out per-km, the Canada Line is carrying 2.10 million annual passengers per km – the same amount that was projected for the Evergreen Line. As costly as infrastructure like the Canada Line SkyTrain is, the investment has been proven worthy by the benefits to the tens of thousands of people using the system daily. A huge part of the reason the Canada Line was so successful was because efforts by the City of Richmond to make the elevated segment on No. 3 Road at-grade (like a light rail system) were defeated, resulting in the construction of a fully grade-separated line. The full grade-separation enabled higher trip speeds, which have been cited in rider surveys as the #1 most-liked aspect of the Canada Line system – outpacing every other favourable aspect mentioned by riders. The Evergreen Line’s SkyTrain switch decision was largely based on favouring the faster travel-times and transferless journeys of a SkyTrain system. It’s thus conceivable that the Evergreen Line could see the same kind of ridership success that the Canada Line did. 3. Were the risks properly and thoroughly assessed? Evergreen services on those parts of the SkyTrain system that are near or at capacity in the commuting peak periods (for example, around Broadway station). These concerns present significant risks and it is of my opinion that they should have been addressed. However, accounting for these risks whenever a large transit priority is laid out in our region doesn’t seem to be common practice. The transit projects of today have continued the practice of tying performance estimates to grandiose plans for the rest of the regional transit system, like the transit vision crafted by the Regional Mayors’ Council that was defeated in the March 2015 referendum. When the referendum went down the toilet, so too did the additional commitments to connecting bus service that would have been critical to the success of the included rapid transit projects. It’s raised concern among decision-makers such as Coquitlam Mayor Richard Stewart, for example, who raised a concern with the potential costs of increasing parking as additional bus services connecting to the Evergreen Line were rejected along with the other proposals. Nevertheless, local governments have forged ahead in planning for these lines, despite the new risks created with the lack of a regional vision component. As I believe that there will be opportunities in the future to return to those other critical transit priorities, continuing planning is the best practice for moving these projects; it has certainly moved the Evergreen Line. 4. How are we going to measure performance? The last issue concerned the collection of performance data to measure performance after the line’s opening. No framework had been set in the 2008 and 2010 business cases, and the lack of such a framework would have a consequence on future transit planning. However, the Auditor did acknowledge in his report that a framework could still be completed in time for the line’s opening. Although it remains to be said if the province has followed through on this recommendation, this issue isn’t relatively as much of a concern as the others as it has an immediate, clear solution. So what’s the real “Evergreen Line Story”? When the Evergreen Line was changed to a SkyTrain extension project in 2008, the switch came after an extended halt in design work and public consultation. Like today’s rapid transit projects, the Evergreen Line was determined through a multiple-account evaluation that includes a Phase 1 (draft option comparison), Phase 2 (detailed option comparison) and a Phase 3 (finalized option comparison and detailed design). The 2006 study was finalized at the phase 2 stage, and it noted that its cost estimates were done at the 90% preliminary design stage. After that, there was silence in the project design work. At the time, there were plenty of issues around project funding (which can be backtracked to on the Skyscraperpage archives). I can understand delays with transit funding (still a very big issue with projects today) but the funding issue shouldn’t have delayed detailed design work on the Evergreen Line LRT project. We didn’t hear anything from planners, politicians or anyone involved regarding the project’s design until rumours of a major announcement surfaced in January 2008. The final business case that was then released in February had been completed by the province rather than TransLink. So it honestly has me raising questions: what exactly was going on in there? Why did Evergreen Line design works come to a stop, and why didn’t the next phase of consultations take place? Perhaps the planners at TransLink realize they under-estimated the LRT costs, and had nervousy about going public with the news? Did local governments start losing confidence in the at-grade project’s business case? There’s all these disconnects that don’t seem to make sense, and I would argue that this should have been of far greater concern than the provincial government’s decision to switch the project to SkyTrain. It’s not the province’s fault the planning department of the time had decided to cut us off for just over a year on the project’s progress. It’s almost as if the sudden switch to SkyTrain was a measure to deal with these problems. This almost certainly indicates that the LRT planning department had run into issues with the design, since the 2006 business case had anticipated the start of construction by September 2007. You be the judge, but it sounds a heck of a lot like that the province managed to narrowly get us out of an Evergreen Line LRT fiasco in its decision to build SkyTrain instead. There hasn’t been a single, grade-level Light Rail project approved in this region except for the currently proposed project in Surrey, and that’s probably what has raised the irk of some people who have been enthusiastic about the idea of at-grade rail. It’s probably why there’s a commonly-held belief that only provincial government overrides result in SkyTrain, and that at-grade Light Rail systems don’t have major shortfalls of their own that have resulted in their rejection here in Metro Vancouver so far. At-grade rail advocates argue that the lack of at-grade rail infrastructure in this region really caused us to lose out on transit benefits (i.e. we could have built a bigger transit network!) but at this point that’s entirely debatable. I think part of this is because the benefits of SkyTrain (and how we’ve built it) don’t seem to be that clear to decision-makers, planners and transit enthusiasts in our region. Despite the constant use of grade-separation and SkyTrain technology, Metro Vancouver’s SkyTrain network expanded at a faster pace than any other system in Canada. Vancouver’s rapid transit growth has lead Canadian cities – and when the Evergreen Line opens to the public next year, we’ll have the longest rapid transit system in Canada spanning nearly 80km – and the longest driverless transit network in the world. The lower operating costs of driverless trains make it possible to keep expanding our transit network without bankrupting our operating budget on the cost of drivers. SkyTrain also has the highest ridership of any rapid transit system in North America that isn’t classified as “heavy” rail. At nearly 9,000 boarding passengers per kilometre, SkyTrain outperforms every single at-grade rail system in Canada and the U.S.
* Q3 numbers were not reported. Data from Edmonton Transit, collected during the same period, used instead. ** Q3 numbers were not reported. NJ Transit’s own FY2014 data is used in place (the same number is reported in APTA’s Q4 ridership report). Now that I’ve finished with my thoughts, I’d like to see anyone try to claim that decisions resulting in SkyTrain projects over LRT are solely a result of senior-government overrides. …or that anyone’s manipulating data to favour SkyTrain in rapid transit studies. Because that’s simply not true. Above: The Canada Line at Marine Dr. Station. Featured photo by Larry Chen. There’s been a lack of clarity when it comes to the big numbers that define the planning of transit systems in Canada. It’s particularly evident when transit technology becomes a matter of discussion. Of course, millions of dollars are at stake. So there’s no doubt that when the cost estimate for a major project is higher by so much as a few million dollars, it’s the kind of thing that sends transit advocates scrambling to get attention and some people in the media practically screaming. All projects were included regardless of technology. Alignment was divided by percentage and split into/measured in 7 categories: on-street, above-grade (i.e. elevated), below-grade (i.e. tunnel, open cut), disused R.O.W. (i.e. railway R.O.W., other empty lands), bored tunnel (the most expensive kind of tunnelling), shared-lane (on-street in mixed traffic like a streetcar), and the total at-grade percentage. 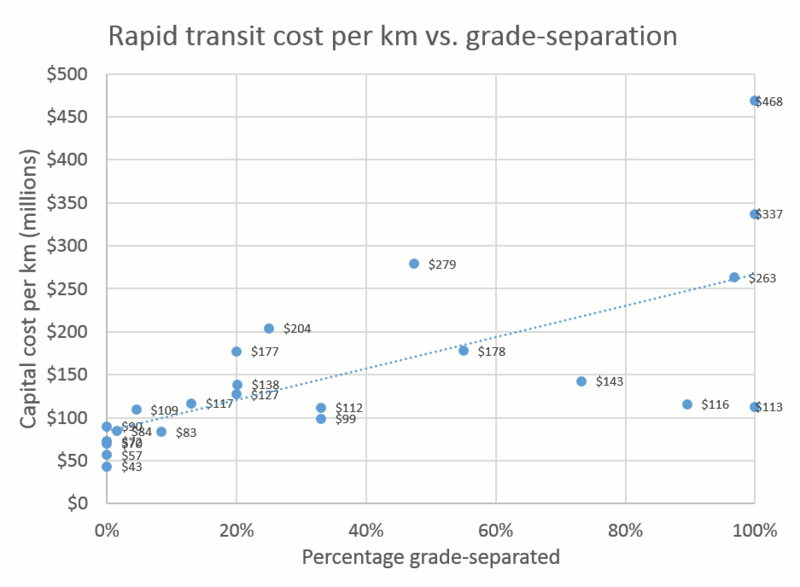 Since the transit planning complaints here in Vancouver always seem to be directed at grade-separation, I decided to focus on seeing if there was a cost trend regarding the amount of grade separation for the line. Several projects end up below the average and several end up above it. As an example, there’s a difference in the four projects on this chart closest to the 100% mark. The highest mark is for the proposed Scarborough extension of Toronto’s Bloor-Danforth subway line, which will be fully underground. The lowest mark is from the estimate for a SkyTrain Expo Line extension in Surrey, which will be fully grade-separated but built in an elevated guideway as opposed to a tunnel. Despite the use of grade-separation, many of the highest-cost projects are not fully grade-separated and feature many at-grade segments that can limit potential. Even projects with only about 20% grade-separation can come close to or even breach $200 million per km. The amount of systems at the 100% mark has decreased from 4 to 3, and the trend-line now hits the middle of these three dots. The middle dot, closest to the line, is the current ongoing extension of Toronto’s Yonge-University Spadina subway line. The lowest dot is the cost estimate for the ‘Broadway Subway’ (the Millennium Line’s proposed extension down Broadway), which is below the trend-line but is built around a medium-capacity system unlike Toronto’s fully-fledged, high-capacity subway. Still, there are some differences to account for in terms of alignment. At the 45-50% mark there are two projects that deviate both from the trend-line and from each other. The higher of these two marks, at $279 million per km, is the Eglinton Crosstown LRT being built in Toronto. The Crosstown was planned as an on-street LRT system, but the central portion will be placed in a 10km dual underground bored tunnel, which spans more than half of the final construction. The lower of these two marks is actually our SkyTrain system’s Canada Line. The Canada Line is a fully grade-separated light metro and a slightly higher total percentage of it is below grade. However, only a much smaller portion of this is expensive bored tunnel – the rest was done as less expensive cut-and-cover. Therefore, it manages to be less expensive despite the full grade-separation. Since only 13% of the Canada Line was built in a bored tunnel, it is now to the left of where it was in the last chart and sitting very close to the trend-line (the Eglinton Crosstown is also closer to the trend-line). Meanwhile, our Evergreen Line SkyTrain extension, which encountered challenging soils with its single tunnel bore, is right on the trend-line when set amongst the other systems. This article surmised that our Light Rail cost estimates are triple what they should be, based on cost estimates being about one-third as much in European and American cities. (And it was, of course, brought up as a way of hurling tomatoes at the idea of a Broadway Subway line – which is still a great idea for a number of reasons). Nice try, Tyee – but the Hiawatha Blue Line is largely off-street and incomparable to Broadway! Interestingly, of all the American cities that could’ve been chosen in the comparison, it was Minneapolis and its Hiawatha Blue Line. This comparison is invalid as over 80% of the line is placed in either disused R.O.W. or tunnel, with only 20% of it being on-street. All of the other examples are from cities in Europe. Regardless of whether you believe these numbers or not, the reality is that transit projects and their costs are more complicated than being able to be broken down into a simple cost-per-km value that can apply nationwide, across nations, or across transit projects. There are differences in labour laws, work schedule expectations, material costs, acquisition costs, logistics costs, varying land values, differences in local terrain and differences in economy. All of these need to be accounted for and thus it can’t be assumed that a transit project that cost a certain amount in Europe (or any other country, really) could be replicated in Canada for a similar cost. Here in Vancouver, for example, any big rapid transit projects are likely to cost more than anywhere else in Canada simply because the higher cost of land would likely significantly raise the costs of project elements such as the operations & maintenance centre (OMC). 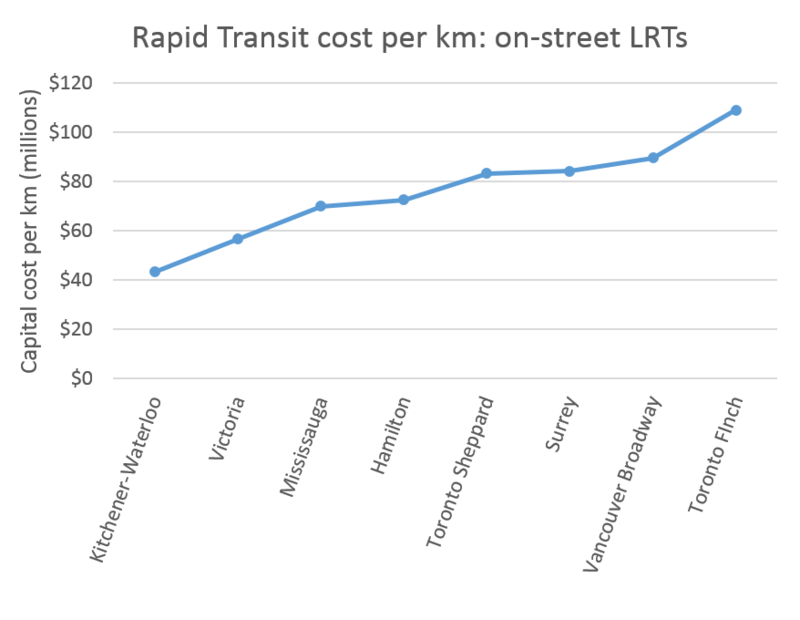 Despite this, at the end of the day, both the Broadway Subway and the LRT proposals were consistent with the trendlines across Canadian rapid transit systems. From the wide spectrum in cost of what would otherwise be similar at-grade, on-street LRTs, it may appear that The Tyee would have a point. Even this can be explained, however. The two lowest-cost systems on this chart are Kitchener-Waterloo’s ION rapid transit and the proposed Victoria LRT system. They also happen to have the highest percentages (44% and 31% respectively) on a disused right-of-way (i.e. beside a railway), which is the least expensive place to build any transit because there’s no utility removal, property acquisition or street-scaping work adding to the cost. With a right-of-way this wide, the Hurontario LRT is not going to need a lot of property acquisition. In the middle are the Mississauga and Hamilton systems, which are slightly lower than the big-city systems in Greater Vancouver and Greater Toronto (they are also among the 3 systems with occasional mixed-traffic rights-of-way), which seems just right to me. The Mississauga system (Hurontario LRT), in particular, is being built on a wide roadway that in most places still has significant allocations on either side where the roadway can be expanded if necessary (in other words, there’s almost no property acquisition). The cost for a Broadway LRT system is certainly on the high-end of the spectrum. This makes sense as a Broadway system would need to offer the highest capacity of all of these systems and would face street-scaping challenges with the need to stay within property lines (though this won’t stop property acquisitions from being necessary at station locations). There’s also the uncertainty around an OMC, which would have likely had to be built underground and/or expensively due to the lack of lands along Broadway and high land costs in Vancouver. In the end, the amount of bored tunnel has a somewhat linear relation with project costs – but grade-separation altogether does not. This doesn’t mean we should avoid building systems with bored tunnel segments from end-to-end (at the end of the day, whether to go that far or not should come down to detailed evaluations of each corridor and transportation needs), but what I do hope to achieve with this article is to facilitate an improvement in the discussion of rapid transit projects (Especially capital costs, since it seems to be the only thing people want to talk about when thinking of rapid transit projects – I, of course, completely disagree). It’s time to stop thinking that we can build paradise if we replicate the results of other countries, at the costs those other countries experience – it’s impossible. Let’s build transit systems that are adapted to the way our cities work, so that we are sure to be rewarded with positive outcomes. The sun is rising over a quiet city, where the lights inside 13 new rapid transit stations turn on and the first station staff make their way down the relatively unused escalators to prepare to open the platforms for the first wave of customers. The familiar hum of a linear induction motor system populates the station as the first of 15 four-car trains rolls in from the maintenance yard, ready to board passengers for the first service of the day. If you think I’m describing an event in Vancouver, you would be wrong because I am describing what’s happening right now in a major Japanese city, one that decided to build a brand new rapid transit line with the same SkyTrain technology developed in Canada and pioneered here in Vancouver. Sendai, Japan is the city that was hit hard during the March 11, 2011 Tohoku earthquake and tsunami. The completion of the new Tozai Line, a 14km rapid transit subway with both underground and elevated stations, has turned the page for the city, marking its vibrance and prosperity as it progresses in its recovery from the devastation of 4 years ago. I went back to Sendai for a business trip, and it also happened to be the day the Tozai line opened to the public. It was crazy! The city and its people are treating it like a big event! Videos and photos of the launch celebrations show thousands of people making use of the new system, and celebrations ranging from idol girl groups performing on the station platforms, local sports team mascots out to celebrate, men in samurai outfits, traditional dance performances on board the trains, and picnics at the park beside the train’s visible elevated section. It is a lively hustle and bustle and the mood appears to be as festive as when I visited Sendai just 4 months ago to attend the city’s most famous Tanabata Festival, as part of my 1-year Japan studies journey. It is arguably the biggest occurrence in the city since this August and the biggest revolution for the city since the first steps in recovery were made after 2011. SkyTrain technology was developed in Canada and pioneered right here in Vancouver. Since the first km of demonstration track opened in early 1983 here in Vancouver, SkyTrain technology has made its way around the world with just over 20 systems complete or being proposed in 15 cities worldwide. We have reinvested in it and expanded our system several times, yet we’ve been overtaken by a certain Guangzhou, China that has made a monstrous investment in this technology with over 99km of track – reaching 130km by next year. Sendai’s will to revitalize their city with the help of a technology pioneered here in Vancouver, Canada should be seen as a wonderful treat and a mark of our contributions to this technology’s progress, and a reminder of the big impacts we can make with choices that we would otherwise deem irrelevant. Sendai’s choice of SkyTrain technology will help the city fast-track its ongoing recovery from the events of 4 years ago. The line will serve 80,000 riders a day next year, with an additional 3% more estimated to come each year and grow the system’s ridership. According to the schedule on the city’s website, trains will run every 3-4 minutes during peak hours and no less frequently than every 7.5 minutes at off-peak times and weekends – an excellent service standard for a medium-sized city of 1 million people. The new line is already enabling new transit-oriented development nodes in the city, maximizing the line’s potential and giving a nod to the transit-oriented development practices that Greater Vancouver pioneered for every city in North America. As a result of the practical research for three years from Fiscal 1985, we confirmed that low-cost subway “Linear Metro” that has been developed as a public transport is suitable for regional hub city as a semi-main metropolitan line or branch line. For this reason, the Japan Subway Association established the “Linear Metro Promotion Headquarters” within the association in October 1988. Japanese researchers started studying linear induction motors (LIMs) as train propulsion in 1985. After Osaka built Japan’s first LIM line (the Nagahori Tsurumi-Ryokuchi line), it was found that the city had saved approximately 20% in construction costs. This is one of the key advantages that come with LIMs – the less-complicated motors enable trains to have lower platform heights, which means tunnels can be significantly smaller and less costly without impacting the quality of service. There is no doubt that with the majority of Sendai’s new subway line tunneled, millions in cost savings were found with the use of SkyTrain technology. This same advantage was directly to blame for the use of an existing railway tunnel on our Expo Line SkyTrain downtown, a choice that saved us hundreds of millions of dollars as a traditional light rail system would have required new and larger tunnels to be dug under our downtown core. Sendai’s system brings the amount of in-service SkyTrain technology systems from 17 to 18. 14 cities/areas are currently using SkyTrain technology, and a 15th (Okinawa Island, also in Japan) has declared its use for a major future transit investment. I am pleased to hear about and report on this successful launch, and I encourage all of us in Vancouver to cheer this Japanese city and its people in celebrating a brand new era of progress and motion.